Mask with Ties: Each mask is designed with cotton cords for easy tying and maximum comfort. Cords come in black, white, or ivory and are matched according to mask color palette. A hanging loop is also included on the back of the mask for wall mounting or T-Bar Display Stand. 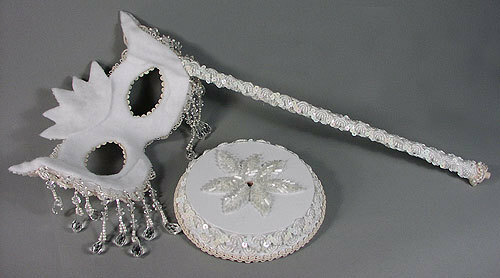 Mask with Decorative Lorgnette: A 15" lorgnette is permanently mounted onto the mask. 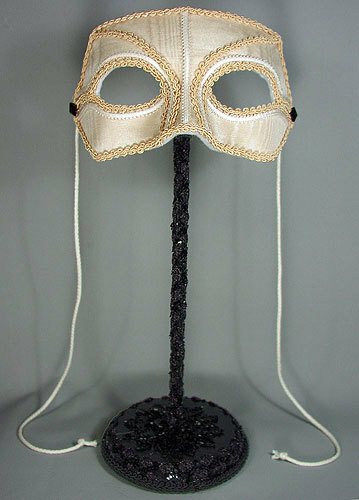 Lorgnette is painted oak and embellished with decorative trim to match the mask. 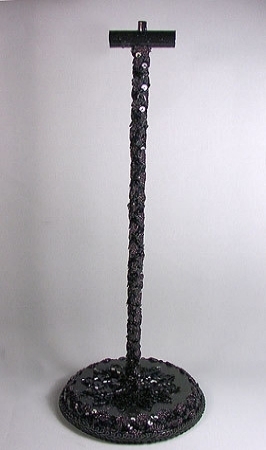 Right-handed lorgnettes standard. Left-handed lorgnettes available upon request - please note in comment box at checkout. Masks with lorgnettes include hanging loop, but do not include ties. Lorgnette and Display Base: The base is solid oak with a 6" diameter, painted and decorated to match the mask and lorgnette. 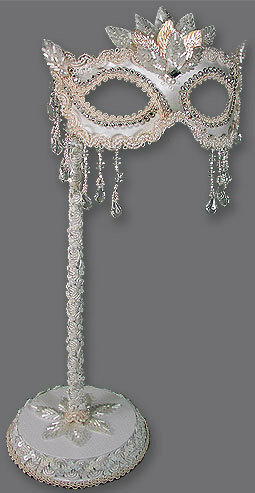 The lorgnette fits snugly into the base and is removable from the base for use. The bottom of the base is covered with soft felt. T-Bar Display Stand: For masks with ties. Stand height varies according to mask design.